Losing all your teeth to decay or a periodontal problem can be a traumatic experience. The ordeal of eating and speaking without teeth is overcome if a patient goes in for dentures. But removable dentures stand the risk of falling out when you are eating or talking, which can be quite embarrassing. This is where implant supported dentures are more patient-friendly. As the name suggests, surgically placed implants support the denture. A denture is a set of artificial teeth that a patient gets after losing natural teeth. An implant supported denture rests in the mouth on top of implants. It fits into the implant with a particular mechanism like a clip, and each denture has two to four implants per arch. To place the implant, the dentist performs surgery to drill the titanium post in the jaw bone. Next, the surgeon places an abutment over the post, which is at the level of the gumline. Though you can have it in both the jaws, an implant supported denture is more common in the lower jaw. As the mandibular arch has less bone support, the need for retention is more. In the upper jaw, regular dentures also offer fair retention. When compared to conventional dentures, implant supported dentures offer better stability and retention. Since they are clipped to the implants, the chances of the denture falling out are almost zero. So, you don’t have to worry about a socially awkward situation while eating or talking. The chewing ability of implant supported dentures is significantly better than that of standard dentures. The former match closely to the natural tooth. Dentures with implants are longer lasting. Removable dentures stand the chance of falling and breakage. This is not the case with implant supported dentures. The longevity of these dentures is more than that of conventional dentures. Implant supported dentures are of two types- bar type and ball type. In the bar type, the bar connects the multiple implants. It follows the curvature of the arch. The denture fits over this bar and is secured in place by clips. The clips are over the denture or the bar, or sometimes even over both. Getting a denture is a lengthy process. Right from the diagnosis and planning to the follow-up, each step requires enough time and patience- both from the dentist and the patient. 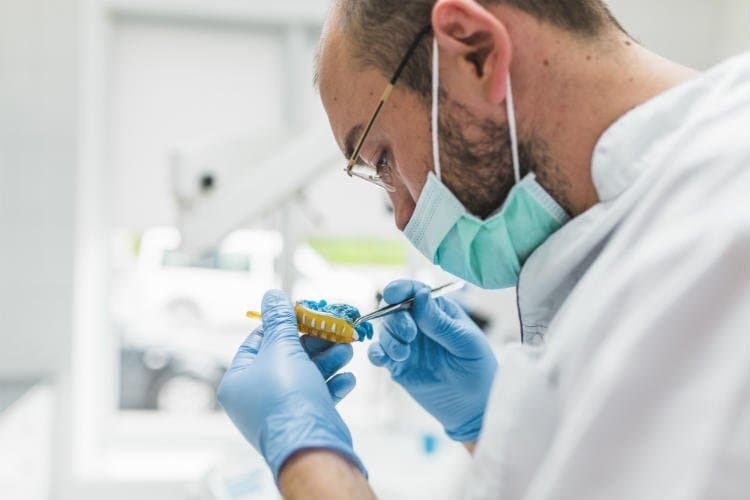 Once you have decided to go in for an implant supported denture, your dental specialist will carry out some investigations to check for the health of the jaw bone. To support multiple implants, your jaw bone should be sufficiently strong and thick. Through radiographs, the dentist can confirm this. If you have any bone disorders, calcium deficiency, or any medical condition for that matter, you must keep your dentist informed. Placing an implant is a surgical procedure, so people with diabetes or hypertensive patients should present a full medical history to the doctor. To sum it up, you should keep your dentist in the loop about absolutely any medical condition you have and any medication that you are on. At the first visit, your dentist may give you a temporary denture for the time until he places the implant. The next visit is the day of the first surgery. In this surgery, the dental surgeon makes an incision on your gums, cuts through the bone and places the metal post. Depending on your bone ridge, height and overall condition the specialist will place two to four implants. Generally, two to four implants are placed. The doctor prefers to put more implants in the anterior part of your jaw to utilize the greater bone support. With the placement of the implant, the process of osseointegration begins. It is the process by which new bone formation occurs around the titanium post. With osseointegration, your jaw bone strengthens to receive the implant. The waiting period between the first and the next surgery is anywhere between two months to six months. In this time, the body accepts the metal implant, and the bone prepares to receive an artificial tooth. If the osseointegration is achieved as desired, your next visit will be to put the healing caps or abutments. In the upcoming surgery, the clinician exposes the top of your implant and places healing caps. These help in recovering from the surgery. In about two weeks, your dentist replaces the healing caps with abutments. The abutments are the small metal parts which over which the denture will rest. At this time, your dentist will also make impressions of your jaw at rest and in occlusion. This is for fabricating a denture for you. In the final visit, you can try on the denture with the metal framework. The ball or bar secures the denture to the abutment, and if the fitting is suitable and agreeable with what the dentist had planned for you, the wax-up is made into the acrylic. In this appointment, your denture will be ready for insertion. It is placed and firmly retained by the attachments. 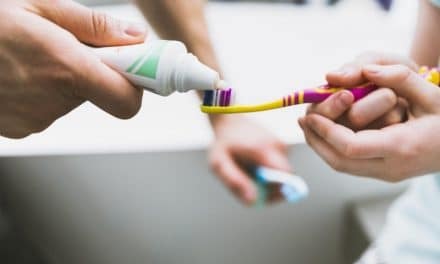 The dentist will give you a detailed orientation with your new denture- how to wear it, how to clean it and what to do to make it last for a long time. You can resolve any confusion or apprehension that you have about your new denture. The implant surgery brings with it the risks that accompany any surgical procedure. (3) The implant also has a chance of failure. This can be because of some oversight in the technique, or the prosthesis being rejected by the body. Your jaw bone may not adapt well to the titanium post. Other surgery-related complications are excessive bleeding, injury to the soft tissues and nerves or fracture of the bone. However, these are rare, and you can avoid them by putting in more caution. It is also possible that the denture does not fit well. This complication is more common with bar retained dentures. More area is taken up by the bar, reducing the area of the denture framework. This can make the teeth lose. Anything that is not natural to your body is going to take some time to be accepted by the immune system. At a smaller level, it will take time for you to get acclimatized to having a denture in your mouth, especially if you have not had one before. Care for your denture like you would care for your natural teeth. Follow the dentist’s instructions about keeping it clean and maintaining its condition. Remove the denture at night and clean it. Always store it in a clean container containing water. Give more care to brush out any debris from the attachment areas. If you feel like the denture is moving too much despite being secure, visit your dentist. You should also set up a dental visit if you develop any ulcers or injuries because of acrylic. Discontinue wearing the denture till you have it checked. The attachments have to be replaced periodically, usually every six months. Do not delay or avoid replacing these nylon parts. An implant supported denture is one of the superior ways to replace missing teeth. 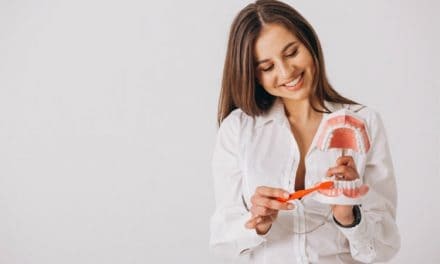 If the body accepts it, and it is made correctly, you will be able to speak with confidence and eat well without the worry of the denture falling out. PreviousWhat is Dental Scaling and Root Planing? 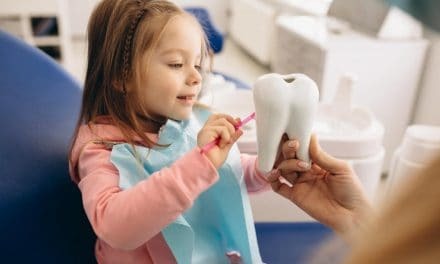 What is a Dental Therapist? Are You Looking for One?